SPACIOUS! IN-TOWN! WATERFRONT! HUGE DECK! 4 BEDROOM! 3 BATHS! 3 Large Bedrooms, Plenty of Extra Room 3 Bath Furnished With Amazing Views. This is not just a home, but an oasis nestled-in on a quiet cul-de-sac with immediate trail access to the Skyridge tennis courts and playground. You feel as if you are in the country but you are right next to Fort Lewis College and downtown Durango. You will have close proximity to Hillcrest golf course as well as a maze of trails for hiking, biking and just simple outdoor fun. What is even more amazing about this property is the view. Just outside your expansive back window or from your private Trex deck, your views to the north and northwest are awe-inspiring. Sitting on your back deck, or from your living room, dining room and even your kitchen, you see the snowcapped La Platas and acres of private land enhanced with conservation easements protecting your view corridor in perpetuity. The backyard actually adjoins the city of Durango reservoir(no recreation activity allowed), so you feel like you have a lakefront property. How about that? No human foot traffic in there, just lots of animals and birds for your viewing pleasure. Besides the deer and elk that visit, here are some of the birds that have been spotted: great blue heron, osprey, bald and golden eagles and of course geese and duck. If you are an ornithologist, this will be a great location for all types of water birds. toilet, shower, Bathroom #1 is a master bath off of the master bedroom. Newly installed air conditioning unit in home! Works great and keeps the house nice and cool in the summer. Newly installed furnace which warms the house nicely in the winter! Kitchen has dining room off of kitchen as well as a dining nook. 55" Inch LED Smart TV in living room/great room. 43" LED Smart TV in master bedroom. Assorted adult movies, children movies, and television series on DVD. Spacious deck great for entertaining with amazing views of the La Plata's and comfortable patio furniture for outdoor seating. Minutes away from the Animas river, and many outfitters who rent rafts, kayaks, sup's and much more. Just 25 minutes to Durango Mountain Resort. A short drive to Hillcrest golf course. Amazing views in a very peaceful location! We stayed in the house for about 6-weeks in the spring and really enjoyed the house and neighborhood. The listing is 100% accurate. 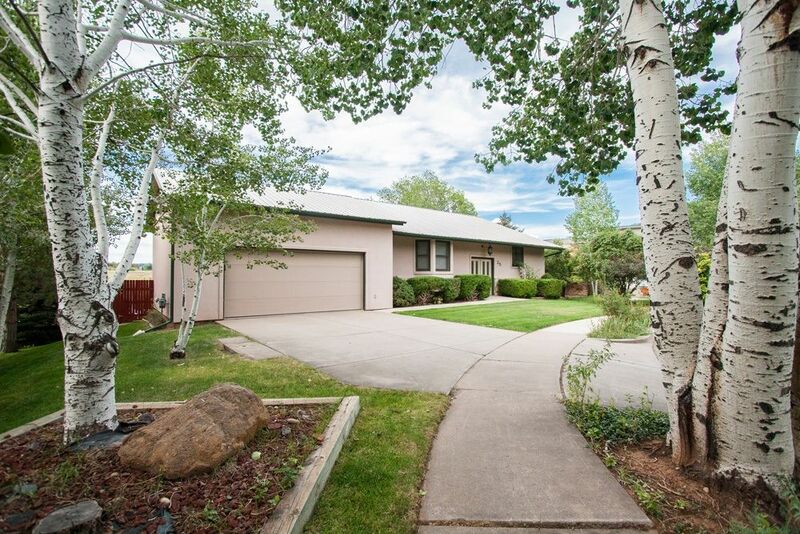 The house has everything you need to cook, bbq, and just enjoy Durango. The view from the house will really knock your socks off. It's quite a find in the middle of the city. Everyday we watched bald eagles, deer, and tons of other wildlife literally in the backyard. The house is huge with a pretty good layout for a bi-level. Overall the house was pretty clean when we arrived but it needed a little more attention to detail. I really like things clean, so I'm nitpicking things like baseboards, ceiling fans, layers of dust on the door frames and pictures. We may have also just stayed at the house right before a good yearly deep cleaning. I know the windows and carpets are being cleaned after we leave, so this is likely the case. The house is a little bit older so there are a few things that need maintenance but the property manager is on top of it, and is also super responsive and extremely easy to work with. The house was really perfect for what we needed. The neighborhood is really quiet with amazing access to local parks and trails. You're also only a few minutes from downtown restaurants, shopping, and grocery stores. The house is quite close to the Durango Natural Foods Co-op http://durangonaturalfoods.coop/ which I highly recommend. Our favorite restaurants are Brew, Steamworks, and Animas Brewery. If you have time visit the Pagosa Springs Hot Springs and Mesa Verde National Park. You won't be disappointed. Picture postcard setting within 5 minutes from town, this home has it all! Clean, comfortable yet tasteful furnishings, flatscreens, and open floor plan so great for entertaining. Loved waking up to families of deer sharing our incredible 180 degree view of the mountains, lake, horse ranch and greenery. Very quiet and peaceful place....we will definitely be back! This house is spectacular and the views are incredible! Minutes away from town, golfing, hiking, biking, and tennis courts. We saw deer almost every morning either our front or out back during our stay. House is great for families, as there is a lot of space for adults and kids to play. Would be nice if there were a pool table in the basement, but great place regardless. Will stay here again! This a great place. Have your coffe on the deck while looking at the best mountain view in Colorado The 180 degrees of mountains, rocks of reds and white and green trees and horse farm across the lake behind the house. Lots of room to spread out and a well equipped house. Five minutes from town. Best place I have ever rented. Bob Hideaway TX. Prices based on 4 person occupancy. $100 per month for each additional guest over the age of 16.